He served his country as a U.S. Navy fighter pilot in the skies over the Pacific in World War Two. Then, as did so many members of The Greatest Generation, he returned home to raise a family and start a business. The company he founded – Enterprise Holdings – grew from a tiny start-up to become one of the business world’s great success stories. 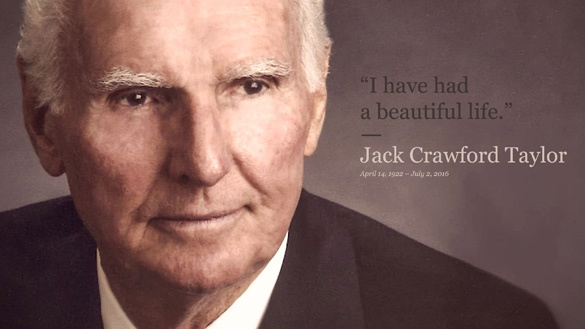 Jack’s simple but innovative approach to meeting customers’ transportation needs transformed an entire industry and set a standard for customer service that few companies in any industry can touch. Over the years, Jack’s standing as a business leader was matched by his reputation as a philanthropist. His generosity has benefited a wide range of organizations, with many of his largest gifts going to support worthy causes in his beloved home town of St. Louis. He was fond of saying that his goal in life and business was simply for people “to think I’m a nice guy.” In the end, he accomplished that … and much, much more.